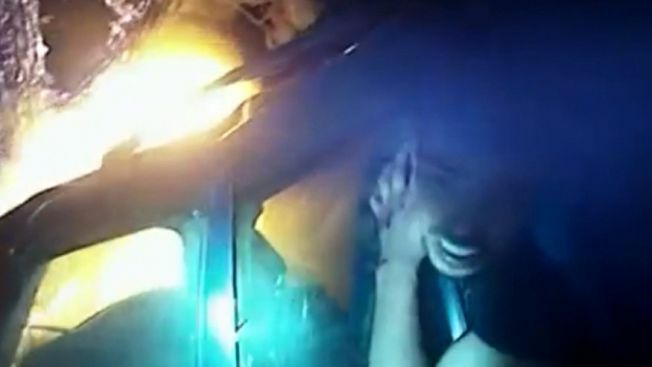 Dramatic body camera video shows a Georgia police officer rescuing a man trapped in a burning vehicle. The incident happened early on the morning of Aug. 16. The video shows Athens-Clarke County Police Senior Officer Dan Whitney arriving on scene and grabbing his fire extinguisher from his trunk to try to put the fire out. He then races to get the man, trapped in the rear seat, out of the vehicle. The impact bent the vehicle's frame and jammed all of the doors shut, forcing Officer Whitney to bend the door frame back enough to pull the man through the rear window. As he did, an explosion from under the hood knocked off the officer's hat and body cam. Police said the driver burned to death in the fire. Without Whitney's rescue, police said the passenger likely would have died. The back seat was completely melted and gutted within minutes. Other officers on scene described the heat from the fire as unbearable from 50 feet away.